I always preferred “Ilish” over “Chingri” even that I am a born Ghoti (with my origin in West Bengal). I don’t even mind much to purchase this over-pricy fish, not more than once a month though 🙁 . Well, at present, in Kolkata, for good quality Ilish (say around 1- 1.5 kg size) the price range is within 1200-1500! Actually, I am that typical Bengali (for that matter my entire family is) who is always emotional about the Maacher Jhol 😛 .We can discuss politics to cricket, Bollywood to Physics over the plate of Bhat and Macher Jhol. This post of mine is about the Bori Begun Aloo diye Ilish Macher Tel Jhol, a bong delicacy. 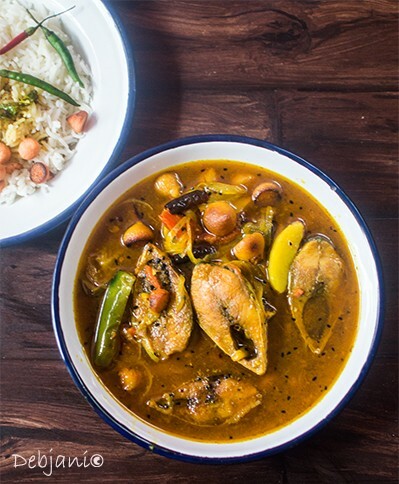 Bori Begun Aloo diye Ilish Macher Tel Jhol, as we call this comforting runny curry prepared with Ilish Mach (Hilsa), Aloo (potato), Aubergine (Begun) and Bori (ummmm what would be the translation for Bori, sun-dried lentil dumplings). Spending overly is indeed worth for the good quality Ilish for that matter! This particular Ilish Maach preparation (Ilish Macher Tel Jhol or the Bori Begun Aloo diye Ilish Macher Tel Jhol) is actually a comfort dish. In fact, completely different from the other curries prepared with Ilish Mach which are mostly richer side. I have had it several times but to be very frank not in my ancestral place. By birth, I am a Ghoti and hence, our Ilish has to be cooked with Shorshe Bata (Mustard paste). Doi Ilish is another delicacy I have seen my mother cooked several times but not the Jhol. I used to have the Bori Begun Aloo diye Ilish Macher Tel Jhol at my Didi’s place. However, I have never seen them calling this runny curry Ilish Macher Tel Jhol. It has always been Ilisher Begun Borir Jhol over there. In fact, it was a no onion no garlic preparation at their place though they are having their origin in Bangladesh. However, I had the similar curry at my friend’s place but cooked with Onion and garlic. Afterwards, I found, that is how the Ilish Macher Tel jhol is prepared in Bangladesh, with onion and garlic. If we talk about the authenticity, I don’t know which version is more authentic; with or without Onion. However, I prefer my Bori Begun Aloo diye Ilish Macher Tel Jhol with little onion and garlic. The recipe of Ilish Macher Tel Jhol or Bori Begun Aloo diye Ilish Macher Tel Jhol is almost similar to that of simple Kobiraji Macher Jhol. Let me now share my version here. Onion Seed/ Kalojire / Kalonjee: ½ Tsp. 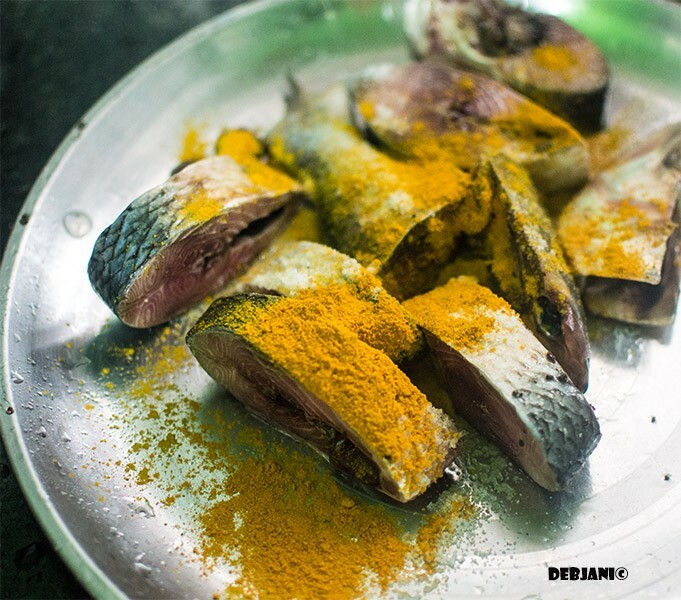 Wash Ilish chunks and sprinkle some Turmeric Powder and salt and rub. Now cut the Potatoes after peeling the skin into Edges. Cut the Aubergine / Begun into long strips as well. Cut the Onion and Tomatoes into long strips too. Heat 3 Tbsp. of the Mustard Oil in a wok and lightly fry Ilish Mach and strain from the oil. 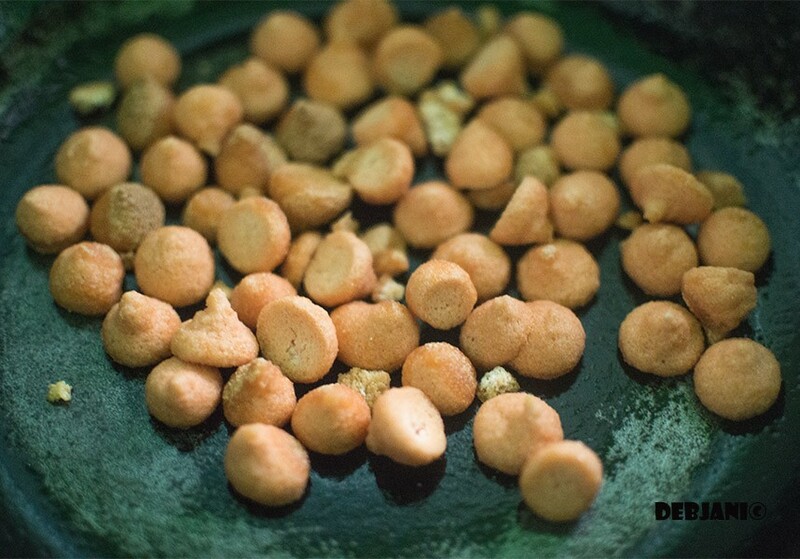 Now fry Potato chunks till those turn golden yellow in color. Rub some salt and turmeric powder to the Aubergine and fry those in the remaining oil. Now fry "Bori" until those turn light brown in color in the remaining oil. Once done, pour 1 Tbsp. Oil and temper the Oil with Red Chili and slit green chili along with Kalojire / Onion Seed. Now add chopped onion and fry the same till onion turn translucent in color. Add ginger-garlic paste and tomatoes and cook till tomatoes soften and oil separates from the mixture. Add a little water and followed by Salt and turmeric powder and cook till water evaporates. Now add fried veggies and 2 cups full of water and bring it to boil. Now add Fried fish chunks and cook for 5 minutes after covering the pan with a lid. Add Fried Bori and cook for a minute. Sprinkle ½ Tsp. of Mustard oil over the Begun, Aloo Bori diye Ilish Macher Jhol and switch the flame off. 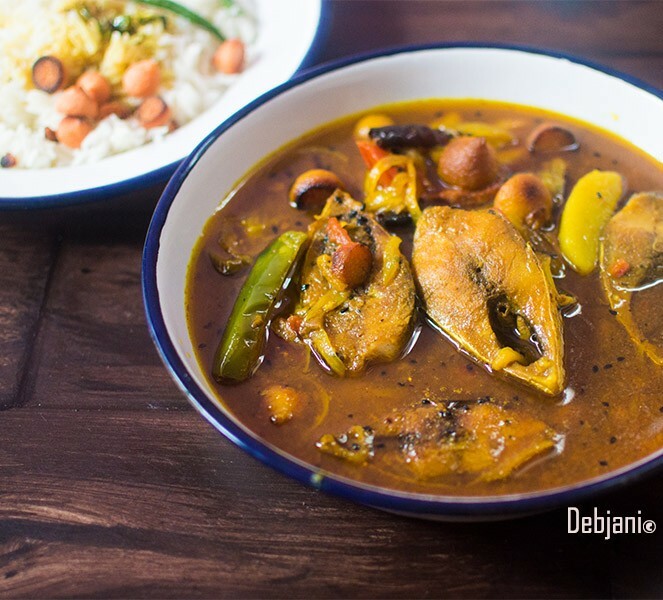 Serve Bori Begun Aloo diye Ilish Macher Tel Jhol (Ilish Macher Tel Jhol) hot with steamed rice. You can skip Onion, ginger, and garlic. You can add little cumin and coriander powder, however, I don't add any spice apart from Turmeric Powder and Salt. Little Chili Powder can also be added. 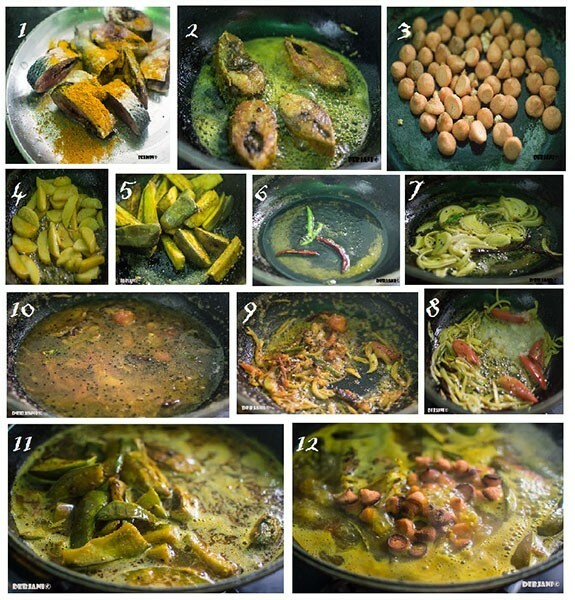 This post of mine is an amalgamation of my favorite Ilish dishes; 10 Ilish recipes to try before you die! 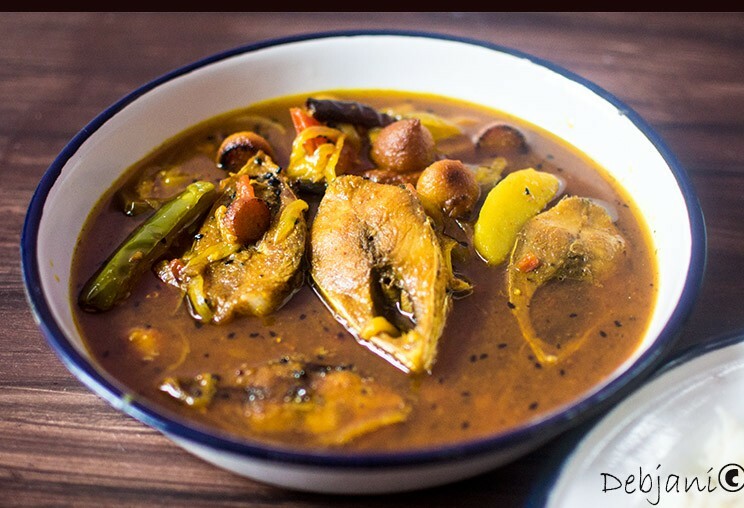 Have you tried the Bori Begun Aloo diye Ilish Macher Tel Jhol Recipe from Debjanir Rannaghar!